Alex made the killer point of the day. Why should advertising agencies be in the business of innovation? Because unlike other businesses advertising agencies bring human insight and creativity to innovation and that is when magic can really happen. His first Innovation Story, the BHG Microwave, illustrated this point perfectly. There was nothing different about the BHG microwave so Saatchi & Saatchi used creativity to make a crucial change - they replaced the annoying microwave 'bing' with a music track and1,000 trial machines sold out in a week. Would Accenture have come up with that? Then came another killer point. Innovation is not just going to happen – it is by its very nature risky - so we need to fight for it. His second Innovation Story, Project FLY, an innovation project done in partnership with Kraft only happened because the sponsor fought and fought for support from her CFO. All us agency people have been there – a great idea which we know will revolutionise a clients business, but budgets are cut and caution takes over. Let’s try and save one idea, every year. Let’s create some more Innovation Stories. Charmaine, Director of Wayra, shared the origin story of Wayra. Founded by José María Álvarez-Pallete in 2010 as he noticed that all the best Latin American entrepreneurial talent was leaving Latin America. Hence Wayra – a reason for Latin American entrepreneurs to stay in Latin America. Wayra translates as ‘wind of change’, which is exactly what the organisation is bringing to the world. Three years on and Wayra has 13 Academies globally helping start-ups find their feet financially as well as strategically making Wayra the single largest incubator in the world. 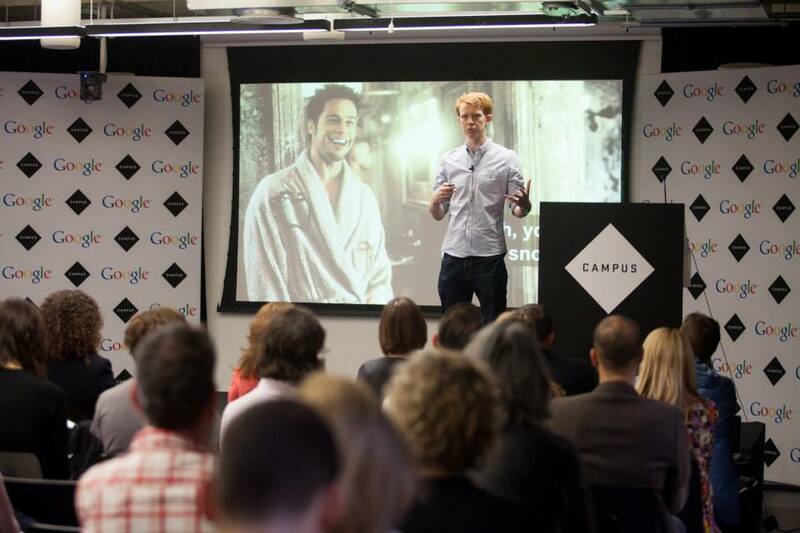 This year, Wayra UK received a staggering 17192 applications, of which only 17 lucky start-ups got picked. Charmaine’s speech was inspirational and stirring and as a mentor for Wayra myself I can’t recommend enough the joy getting involved brings. So check out this years intake. 3. Incipient wants – are the ones that people don’t know they even have. You meet incipient wants by creating something completely novel, yet desirable. This is where real innovation happens. But these can only happen through experimentation, insight and serendipity – harking back to Alex’s point about what Advertising agencies are good at. John also feels very strongly that innovation should happen in public, not in secret. And you should not be scared about sharing as your iteration efforts should always be one step ahead of the people trying to emulate you. John is an ex-agency person who now spends every day helping companies to innovate. There is a lesson in that for us all. Tom started off with a quote from William Gibson, “The future is already here – it’s just not evenly distributed.”. His Innovation Story focussed on the dilemma Sony found themselves in when the Beats by Dre headphones started to outsell their own. The reason – Sony had lost touch with their customer so they immersed Japanese headphone designers into the clubs and DJ culture of the people they were targeting. Through this immersive technique they were able to envision what the landscape looked like 2 / 3 years in the future. But most importantly this innovation approach enabled Sony to come back on top with Sony now dominating headphone market share. Hamish Nicklin, Head of Agency Relationships at Google, then blew our minds talking about Google Moonshots. First up, Project Loon which aims to bring internet to two-thirds of the world's population using internet-beaming hot air balloons. The project has been in the works since 2011and the solar powered balloons fly at high altitudes to provide broadband to areas without internet access. He then touched on Google Fiber, which provides an internet connection that's up to 1,000 megabits per second, and is the fastest in the U.S. Only available in a few cities it is rolling out across the States in the next few months. Then came driverless cars - you heard it here first! The day came to a close with a heartfelt talk from Andy Law, founder of St Lukes, who explored the difference between creativity and Innovation. Creativity he suggested is the personal - what you can achieve as an individual to express your thoughts and ideals. Innovation is business driven, it has a commercial objective at it's heart. And yet Innovation is not possible without creativity - we have to allow room for both. And so the day came to an end with minds buzzing, new connections made and much ambition for next year. A huge thank you to Google for hosting and for Creative Social for providing logistical support. Bring on 2014!